In addition to the generic File asset, there are other specific file type assets with very similar functionality. These are useful to use instead of the generic File asset as it controls which type of file can be uploaded against the asset. They are also useful for when you want to implement Search Pages or Asset Listings that specifically target certain file types. Some of these asset types also have additional functionality that supports their specific file type. The documentation on this page will only refer to the additional functionality that is available for each file asset type. To read about the generic functionality of file type assets, refer to the File asset chapter. Extract ID3 Metadata: Enable this to extract any metadata from the audio file to apply to the asset. Write ID3 Metadata to file: Enable this field to write any metadata from the audio asset to apply to the audio file. The Details screen of this asset includes a section for adding additional information against the file. 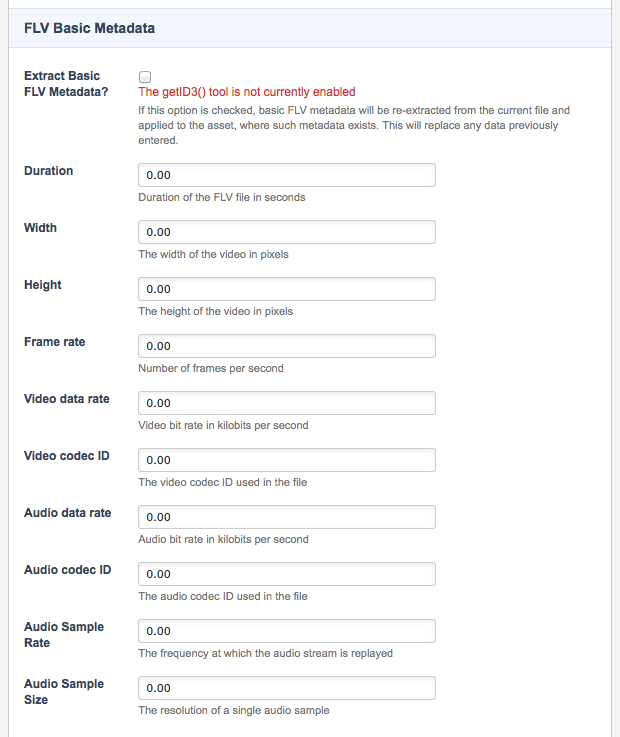 The top of this section includes an option called Extract Basic FLV Metadata. Enable this to extract any metadata from the file to apply to the asset. Extract ID3 Metadata? : Enable this to extract any metadata from the mp3 file to apply to the asset. Write ID3 Metadata to file? : Enable this field to write any metadata from the MP3 File asset to apply to the mp3 file. The top of this section includes an option called Extract Video Metadata. Enable this to extract any metadata from the file to apply to the asset. This screen allows you to specify an XSL File to use for extensible style sheet language styling of the XML File when previewing the asset. Please note that this option requires PHP to have XSL support supplied in your system. If your system is running on Debian, you will be required to install the php5-xsl package on your system. XSL Transformation: Select an XSL File to use and click Commit. This XSL File will be used to stylise the content of the XML File. This style will be reflected when previewing the asset on the frontend. Replace Global Keywords: If set to Yes, global keywords in the XSL File will be replaced when applying to the XML data. An XSL File can be used on the Transformations screen of an XML File asset to stylise the content of the XML. The Transformations screen is shown in the figure below. In the example above, an XSL File has been selected in the XML Transformations section and will be used to style the XML File. Text based file asset types allow you to create them without needing to upload an existing file first. Simply just enter a Title for the file and click Save. This will create an empty text file of that type. Text based files allow you to edit them directly within Squiz Matrix. You can edit the contents of these files on their Edit File screen. Uploading a new file from the Details screen will off course overwrite and custom edits you have made on the Edit File screen. Some file types allow for automatic metadata extraction of the physical file when it is uploaded against the asset. This is used via the getID3 external tool that must be enabled for automatic metadata extraction to work. If the tool was enabled when a file asset with getID3 metadata extraction support was first created, any metadata will have been automatically extracted and applied to the additional fields. If it was not enabled, an error message will be shown, as seen in the example below. For more information on the getID3 tool, refer to the System Configuration manual.